The Antikythera Mechanism is the Oldest Analog Computer - Fact or Myth? The Antikythera mechanism is generally considered to be the world's oldest known analog computer. What Was the First Analog Computer? With that in mind, Astrolabes (which are similar, but less complex devices) and other precursors to the Antikythera mechanism are thought to have existed around the same time. FACT: It wouldn’t be until the mid 1800’s that Babbage and Lovelace revolutionized computing on-paper and then it wouldn’t be until the mid-1900’s that Turing helped revolutionize digital computing (all inspired by figures like Pascal). These are only a few names from a long history of analog, digital, and theoretical computing. This 2012 BBC documentary looks at the history of the Antikythera mechanism. Keep in mind we have learned more about the device since 2012, check below for recent findings. An analog computer is a form of computer that uses physical variables to solve problems. The Antikythera is the first known device to fit this definition. The Antikythera mechanism is the world’s oldest known analog computer. Recent evidence shows it could date back to 200 BC or beyond. The Antikythera mechanism was discovered in April of 1900 by sponge divers in a shipwreck near Greece. Although it’s purpose wasn’t discovered until almost 50 years later by Derek de Solla Price. The Antikythera mechanism worked as a fully functioning calendar that could predict the positions of known celestial bodies using a complex series of gears. FACT: Astrolabes were also thought to have existed in and around the time of the Antikythera mechanism, as did other similar mechanisms. Despite this, we don’t have any existing examples that predate the Antikythera mechanism and the astrolabes we do have are notably less complex. The Antikythera Mechanism is an astronomical calculator with the ability to predict lunar and solar eclipse as well as solar, lunar, and planetary positions. It worked as a full functioning calendar that could predict planetary positions, lunar and solar eclipses, and even show when the next Olympic games would be. The device consists of a clockwork-like mechanism containing over 30 toothed gears, including a system of differential gears. Each gear was carefully crafted with a specific number of teeth so it could work together with all the other gears to be perfectly accurate. It’s considered by many to be the first mechanical analog computer due to the fact that it uses physical gears to compute information about the future position of the solar system. The Antikythera mechanism was discovered by Greek sponge divers (who found the device at 42 meters without SCUBA equipment or compressed air) in April of 1900 in the Antikythera wreck off the Greek island of Antikythera, between Kythera and Crete. The divers took the device and many other newly found artifacts from the wreck to the National Museum of Archaeology in Athens for storage and analysis. At the time of it’s discovery no one really understood what the device did, it simply appeared a “lump of corroded bronze and wood”. It wasn’t until two years later that, on May 17 1902, archaeologist Valerios Stais noticed that one of the pieces of rock had a gear on it. Stais initially (and correctly believed) it was some sort of astronomical clock, but scholars had thought that an astronomical clock would have been to complex compared to other items found on the wreck. The investigation was dropped. The device wasn’t studied again until British science historian and future Yale University professor Derek J. de Solla Price became interested in it in 1951. In a June 1959 Article in Scientific American he first announced to the mass public his theories on the device. He concluded that it was a type of astrolabe and commented on the inscriptions, how it may have been used by the Greeks, and how the gears would have worked. In the piece he mentions getting photographs made for him in 1955 by Athens museum technicians. These photos inspired him to, in 1958 with the help of Greek epigrapher George Stamires, take a closer look at the device and it’s workings. In 1971, both Price and a Greek nuclear physicist named Charalampos Karakalos made X-ray and gamma-ray images of “the lump” leading to the discovery that it was actually 82 fragments (7 main and 75 smaller fragments). Price published an extensive 70-page paper on their findings in 1974 in which Price theorizes that the device, judging by the gears, was an analog computer from ancient Greece from around 87 BC, likely on the island of Rhodes (due to the exceptional astronomical minds at the time like Greek astronomer and mathematician Geminus). An interesting documentary from 2014 on the Antikythera Mechanism focused on modern researches of the device. Since Price’s 1974 paper many have studied the mechanism and Price’s theories. Many scientists have devoted themselves to expanding and refining theories about the Antikythera mechanism. One very productive team was led by Mike Edmunds and Tony Freeth. They worked with a large international team of astronomers, mathematicians, computer experts, script analysts and conservation experts. In 2008, members of Tony Freeth’s Antikythera Mechanism Research Project deciphered the names of the months written on the device’s dial and, after concluding they matched the calendar used in the Corinthian region of ancient Greece, suggested it was built there as early as 150 B.C.. They also discovered that a small dial on the mechanism was devoted to the locations of Panhellenic games, which included the ancient Olympics. A 2014 New York Times article reported on the results from a recent study devoted to the mechanism’s eclipse predictor dial. In the study, science historian Christián C. Carman and physicist James Evans determined that the device’s calendar likely began in 205 B.C., suggesting that the Antikythera mechanism is even older than previously believed. The mechanism is in 7 main and 75 smaller fragments at the National Archaeological Museum in Athens. The mechanism contains 30 bronze gears, with between 15 and 223 triangular teeth. he mechanism is an astronomical calculator with the ability to predict lunar and solar eclipses, as well as solar, lunar, and planetary positions. It is based on the theories of Hipparchus, and on the elliptic Lunar orbit. The inscription on the mechanism’s flat surfaces is an instruction manual in its use. Is a Mechanical Analog Computer “a Computer”? Analog computers are not the same as digital computers. In modern language when we say “computer” we are talking about digital computers. Despite the semantic differences a mechanical analog computer or “analog computer” is a term used to describe analog precursors to the modern digital computer (and even modern analog computers) that use physical phenomena such as electrical, mechanical, or hydraulic qualities to model the problem being solved by the computer. Thus, the Antikythera mechanism is a “mechanical” analog computer. The device, along with the astrolabe can also be referred to as a mechanical astronomical calculator. Are There Other Devices That Could be “the Oldest Analog Computer”? It’s believed that there are undiscovered predecessors to the Antikythera mechanism that have been lost in history, the Antikythera Mechanism is the only known device of this type. An astrolabe is a device that like the Antikythera mechanism can tell predict lunar and solar and planetary positions. The astrolabe was believed to be invented in the Hellenistic world in 150 BC. Sometimes the astrolabe is mentioned side-by-side with the Antikythera mechanism when discussing the first analog computer due to them being traced back to similar time periods. The Antikythera mechanism is considered to be the oldest known analog computer. When talking about computational devices, in general, we can look all the way back to the tally stick or abacus. 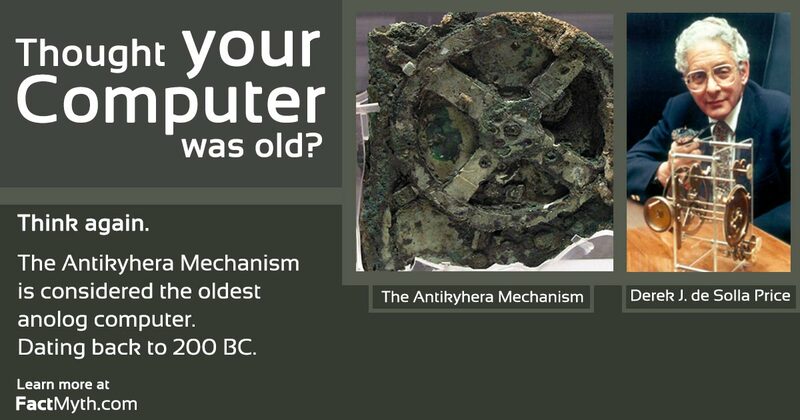 However, for analog computers the Antikythera mechanism is believed to be the earliest known example. That being said we know that astrolabes were written about before the earliest current estimate of the Antikythera mechanism’s origin in around 200BC. The earliest example of an astrolabe we have today is from around 1,000 years after the Antikythera mechanism. Price, D. de S. “Gears from the Greeks: The Antikythera Mechanism — A Calendar Computer from ca. 80 BC”. Trans Am. Philos. Soc., New Series, 64, Part 7 (reprinted as Science History Publications, NY 1975), (1974). (cited in “Decoding the ancient Greek astronomical calculator known as the Antikythera Mechanism” (PDF). Retrieved 20 May 2014. Freeth, Tony; Bitsakis, Yanis; Moussas, Xenophon; Seiradakis, John. H.; Tselikas, A.; Mangou, H.; Zafeiropoulou, M.; Hadland, R.; et al. (30 November 2006). “Decoding the ancient Greek astronomical calculator known as the Antikythera Mechanism” (PDF). Nature. 444 Supplement (7119): 587–91. Retrieved 20 May 2014. “GEARS FROM THE GREEKS: THE ANTIKYTHERA MECHANISM AND THE EARLY HISTORY OF COMPUTER SCIENCE“. Dr. J. Reece Roth, Professor Emeritus UT Plasma Sciences Laboratory. Hist.science.online.fr. Retrieved Oct 11, 2015. “Analog computer“. Wikipedia.org. Retrieved Oct 11, 2015. “The Antikythera Mechanism Research Project“. The Antikythera Mechanism Research Project. Originally Retrieved by Wikipedia author 1 July 2007. Retrieved Oct 11, 2015. Allen, Martin (27 May 2007). “Were there others? The Antikythera Mechanism Research Project”. Antikythera-mechanism.gr. Archived from the original on 21 July 2011. Retrieved 24 August 2011. “Antikythera mechanism“. Wikipedia.org. Retrieved Oct 11, 2015. “Derek J. de Solla Price“. Wikipedia.org. Retrieved Oct 11, 2015. Lobell, Jarrett A.: “The Antikythera Mechanism”, Archaeology, March/April 2007, pp 42-45. Source cited by GEARS FROM THE GREEKS: THE ANTIKYTHERA MECHANISM AND THE EARLY HISTORY OF COMPUTER SCIENCE. “The Earliest Surviving Dated Astrolabe (927 – 928)“. Historyofinformation.com. Retrieved Oct 11, 2015. “The Antikythera Mechanism: An Ancient Computer of Astounding Complexity“. Slate.com. Retrieved Oct 11, 2015. “On the Trail of an Ancient Mystery Solving the Riddles of an Early Astronomical Calculator“. Nytimes.com. Retrieved Oct 11, 2015. “The Antikythera Mechanism“. Age-of-the-sage.org. Discussing “An Ancient Greek Computer” Lead article in Scientific American in June 1959. Retrieved Oct 11, 2015. Great comment. On the plus it is also very hard to infect with malware despite this.